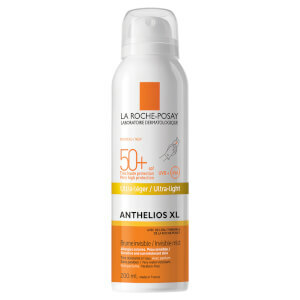 Catering specifically for blemish-prone and oily skin types, the La Roche-Posay Anthelios Invisible Face Mist SPF 50+ offers exceptionally high, broad spectrum protection against UVA and UVB rays. Fortified with Airlicium (a breakthrough ingredient used by NASA), the non-greasy spray forms an invisible, breathable veil over skin to ensure a long-lasting matte finish with no white marks. With a light, fresh texture of a thermal spring water, the ultra-moisturising, water-resistant sunscreen mist absorbs quickly to shield from sun exposure, whilst promoting a smooth, supple complexion with minimised shine. Can be worn alone or over makeup. Hypoallergenic. Tested on sensitive skin. Apply just before sun exposure. Spray at a minimum of 15cm from face. Spray evenly onto face but don't spray more than 3 seconds at the same place. Close and protect the eyes and the mouth during the application. Do not intentionally inhale. Wipe excess product from the eyes and mouth. Re-apply frequently and generously to maintain protection, especially after swimming, perspiring or towelling. Avoid eye area, in case of contact with eyes, rinse them immediately and thoroughly. Butane, Aqua/Water, Homosalate, Octocrylene, Glycerin, Dimethicone, Ethylhexyl Salicylate, Dicaprylyl Carbonate, Nylon-12, Diisopropyl Sebacate, Butyl Methoxydibenzoylmethane, Styrene/Acrylates Copolymer, P-Anisic Acid, Caprylyl Glycol, Carnosine, Cyclohexasiloxane, Disodium EDTA, Drometrizole Trisiloxanel, Ethylhexyl Triazone, Methyl Methacrylate Crosspolymer, PEG-32, PEG-8 Laurate, Phenoxyethanol, Poly C10-30 Alkyl Acrylate, Polyglyceryl-6 Polyricinoleate, Sodium Chloride, Sodium Hyaluronate, Tocopherol, Parfum/Fragrance, Code F.I.L C186282/1.r. Amazing over make up to avoid that awful white cast Great item, highly recommend as long as you don’t mind the hefty price tag for the size of product that you get. This is an amazing face sun cream, completely invisible on the skin, no shine left and no residue, literally just feels like your spraying cold air on your face but really it's going to protect you from sun damage! I have seen people comment how it doesn't sit well on top of make up, and I can only imagine why, as sun cream is not protecting your make up, it's protecting your skin therefore it needs to be applied onto your skin prior to makeup! I apply mine after cleansing and before my moisturiser and I have combination/acne prone skin and it hasn't broke me out or made any changes to my skin! 10/10 product and would recommend to everyone! I wanted a sun cream I could put over makeup. You don't get much in the bottle and it's hard to know if you have covered whole face. Top marks for this product, which I've used ever since it launched last year. It's great for topping up your SPF levels later in the day without disturbing your makeup. It doesn't irritate my watery eyes either. Bonus! 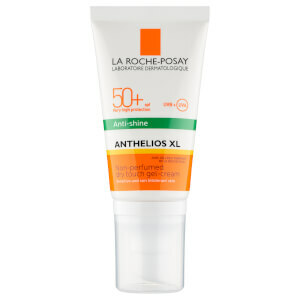 I have previously been using La Roche-Posay Anthelios XL Anti-Shine Dry Touch Gel-Cream SPF50+ (50ml), which seems to be the only high SPF cream that my combination skin tolerates without breaking out. I wanted to try this for the convenience of being able to spray it on over makeup and also because you get a bit more for your money (75ml). However, this is not the same product although the anti-shine green label might make you think so. This spray leaves my skin feeling oily and you get a layer of fine white droplets that catch on the peach fuzz on your face. I'm sure it works for some people but not what I was looking for. 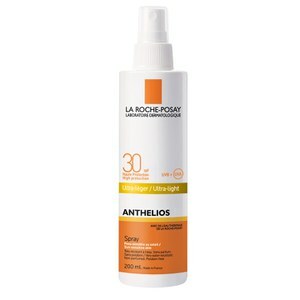 This sunscreen is great, comes out as a very light, almost invisible mist. Spreads amazingly well and is absorbed within seconds. And most importantly, it doesn't leave my skin shiny nor smelling strongly of SPF! Highly recommend to anyone with oily skin. If you are religious about sunscreen and a retinol and peel user like myself it makes sense to reapply sunscreen throughout the day and this product allows you to do this , over make up , at work ( handbag sized) it dries clear and has become a beauty necessity of mine . Will repurchase and a good price . Absolutely great thing to refresh your sunscreen during the day. Lightweight non-oily coverage, plus the bottle is light enough even for a small bag. So far this is the best sunscreen to reapply without removing my make up (not sure though that such a thin spray would give an SPF50). Good price , fine mist , before or over make up . Will definitely repurchase !